Hmong women working in domestic violence programs organized a series of meetings to understand the trends and issues in international marriages and to explore possible actions to address abusive international marriages. They saw its connections to sexual and domestic violence and the impact on their communities; and wanted to find out what is happening. Hmong advocates, Hmong women activists, victims/survivors of the practice of abusive international marriages, community leaders and allies came together to learn and strategize. Their documentation of the problem and its impact, analysis, survivors’ stories, and strategies are captured in Abusive International Marriages: Hmong Advocates Organizing in Wisconsin. 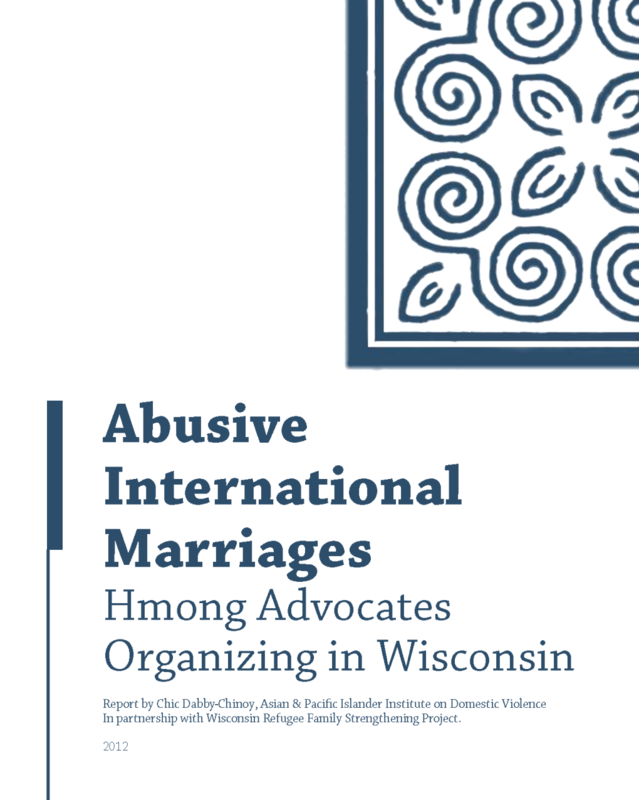 As the report clearly shows, Hmong advocates emphasized understanding the complexities of abusive international marriages and articulating a vision of and strategies for community change. It takes courage to address difficult problems in an open forum: the importance of being protective of one’s culture and community has to be balanced with speaking out against harmful practices. These discussions demonstrate how deeply Hmong advocates are invested in their communities and in cultural change work. Their powerful activism is a testament to culture as a dynamic, ever-changing force that mobilizes community assets to prevent sexual and domestic violence. This report belongs to Hmong advocates, activists, survivors, and community leaders; the inspiration their work offers belongs to all of us.